Bali Saikoh Surfing School has their shop in Kuta Bex in the central area of Kuta Beach. The school is owned by a pro-surfer who is famous in Bali. They offer great lesson that eveyone can enjoy. Saikoh Surfing School has their shop in Kuta Bex in the central area of Kuta Beach. It is owned by a famous pro-surfer in Bali, and professional instructors who learn from the pro-surfer. Instructors speak English for lessons. Surfing school by a pro-surfer in Bali! 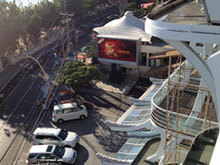 The office is in KUTA-BEX in the central Kuta! Pro instructors learned from pro-surfer offer lessons! Training basic skills on land! Instructor support each guest and advice! Don't worry your swimming skill, lesson in shallow point! Saikoh Surfing Shool is runned by pro-surfer in Bali, and a pro-surfer teaches middle level students who want to skill up. For beginners, well educated professional instructors learned from a pro-surfer offer lessons! They offer 3 courses; Total Private (1 instructor for 1 student), Semi Private (1 instructor for 2 students) and Group (1 instructor for 2-4 students). The lesson is devided by 2 rounds. The length of lesson is total 2.5 hours; beach training, take-off on land, 1st round and 2nd round of surf lesson. saikoh Surf changes school schedule / pick-up time everyday because they offer lessons in best tide on the day. I cannot swimm but is it possible to join lesson? It's no problem if you cannot swim. Lesson is held at the shallow beach and instructor suports and keeps your safety. Do you offer insurance for injury? Yes, we provide max. US＄100,000 insurance for age 10 - 50. Please enjoy surfing without worry. Can you take pictures during lesson? Yes, no problem. However, we have limited number of guests to provide transfer service, so max. 2 people are possible. Change schedule along with tide condition. I was coached in Japanese, by a nice and friendly instructor. 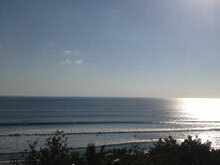 The location was in Kuta and experienced surfing lesson I could enjoy shopping. The instructor was a professional surfer, it`s like a dream if in Japan. It was a good experience and good memory.